Carly Horowitz is majoring in Communications with a concentration in Journalism at Marist College and plans to graduate in December 2019. She serves as the Director of Finance for the Marist Chapter of Public Relations Student Society of America, a position that hones both her PR and business skills through managing the club’s finances and creating and executing fundraisers. She attended the PRSSA National Conference in Boston this past October to represent Marist. She is also the Chief Marking Officer for Marist Business Review and handles media platforms and posts on the Marist Business Review Facebook page. Her undeniably strong work ethic has helped her strive in her job at Torta Fina Bakeshop in Babylon, New York for over two years. This job has sculpted her communication skills due to a variety of encounters with customers. Additionally, Carly is an active member of Campus Ministry at Marist College. She also recently started the position of Editorial Associate at For The Record, an extension of the Marist College newsletter, Marist Circle. In this position, she gets to interview students of Marist College and craft their stories to be published. She feels blessed to be able to use her writing skills to help other students have a voice. 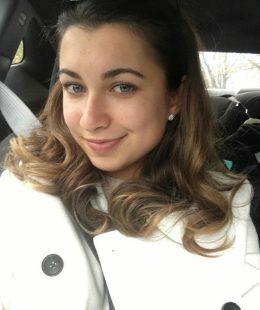 Carly began as an editorial intern at CupidsPulse.com in January 2018 and is overjoyed with the ability to showcase her love for writing. In her free time, she enjoys reading, skiing in the winter, boating in the summer, and spending time with her family. Her all-time favorite celebrity couple is Blake Lively and Ryan Reynolds. Her favorite date night activity is simply chilling with her boyfriend while they cuddle, drink tea, and watch movies.